I wanted to develop a bit further on my “comment” responding to Baz’s Local/Global post — specifically his emphasis on the inherent theatricality of our chosen sites. This is very apparent at the Fountains Abbey & Studley Royal estate especially, which is essentially a giant, eighteenth-century stage set, built with living materials. Take a look at this “Surprise View” of the Abbey down the Skell valley, specifically engineered as part of the estate’s picturesque landscaping. I couldn’t help wondering how many other 425-year-old wooden stage sets there are left in the world — this one is apparently supposed to represent the Thebes of “Oedipus Rex” (the theatre’s first production), lovingly preserved in suspended animation. 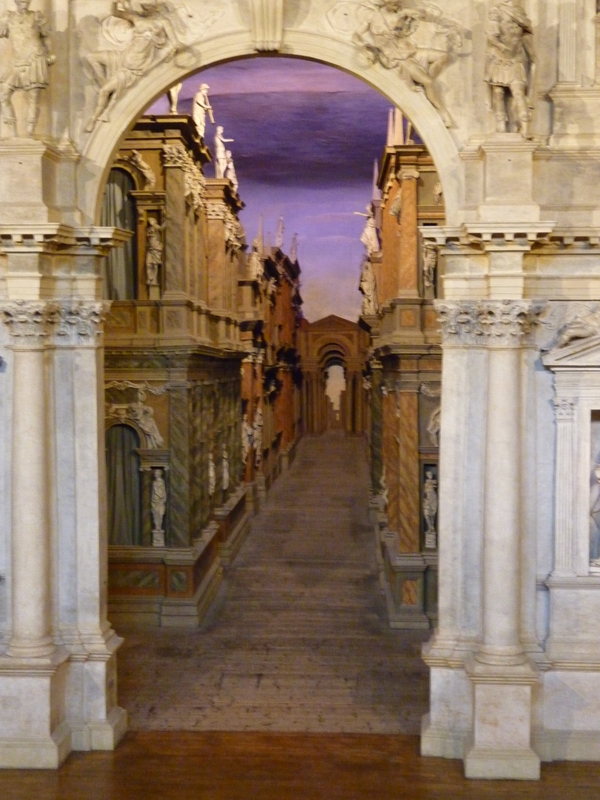 But the fragile scenery has been able to survive in part because it is so well-protected from exterior elements: the Teatro Olimpico was built within the so solid walls of Vicenza’s former city jail (there’s a pun here somewhere on ‘captive audiences’ that I’m not bright enough to figure out just now). 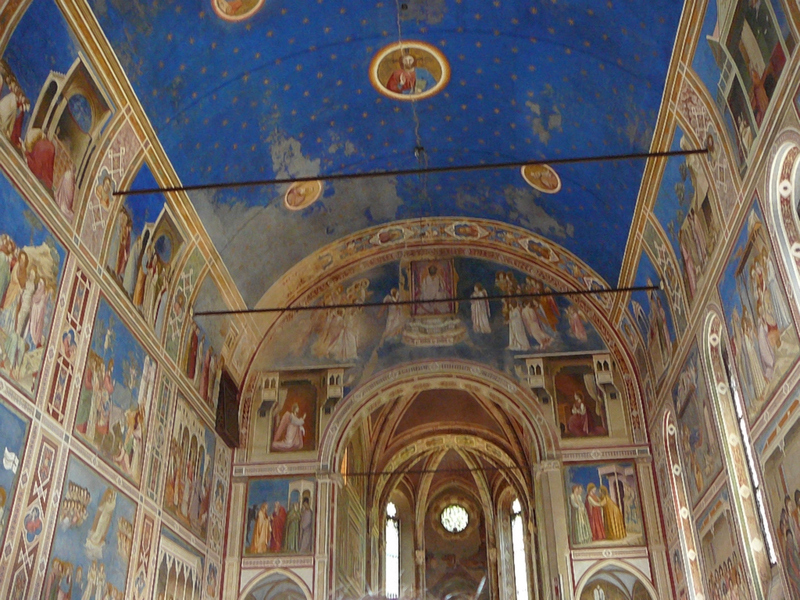 A few days later I saw Giotto’s extraordinary Chapel Scrovegni in Padua – commissioned by the Scrovegni family around 1300 to atone for the sins of their usurer patriarch (so bad he gets a namecheck in Dante’s Inferno). Giotto painted images from the lives of Mary and Jesus from floor to ceiling on every wall of the chapel, and added a star-studded sky across the vault that is still the most stunning azure blue after 700 years. (A theatrical space if ever there was one.) But some of the images have decayed somewhat, and not so long ago it was realised that this was because of external atmospheric pollution. After a major renovation a few years ago, visitors are now admitted to the chapel in groups at 20 minute intervals – having sat for the same period in a sort of air-lock space, watching a video about the chapel’s history. 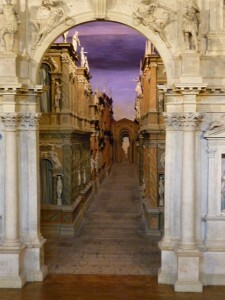 This zoning phase allows the exterior air that visitors have brought in with them to be filtered out, thereby protecting what they call the “micro-climate” of the chapel itself. An attempt precisely to *arrest* environmental change in a controlled, enclosed space. Of course, the same cannot be done for the similarly aged Fountains Abbey. I’m reliably informed that bits of the over 800-year old masonry have just been falling off it this year — as the medieval mortar expands and contracts with the rapid temperature fluctuations that we’ve experienced during the spring and summer. Fountains exists in a “microclimate” of its own — a characteristically damp one, given the way that clouds come across the narrow Skell valley and drop their loads, and the rainwater then drains down the steep hillsides into the river itself. But even after the devastating flooding of 2007, the sheer dryness of this year has left no ground moisture to speak of. There’s little flow to the river, and the Georgian lakes are clogged with weed as a result. This microclimate, needless to say, cannot be regulated by airlocks, and so this ancient, very vulnerable “stage set” is increasingly being subjected to erratically destructive exterior forces. Having now visited Fountains I would agree with the idea that it bears the marks of an 18th century theatricalisation, a narrative of unfolding views, of stripped down sublime ruins and geometrical-symbolic plantings and excavations and halting of flow (reflections as impossible stages) – BUT, what also struck me was that there is almost nothing in the way of a script provided. The modern paths down to the ‘site’ from the Visitors Centre are misleadingly efficient and non-preparatory. Signs and written materials provide hints, but no coherence narrative of the drama of moving through the site. Perhaps what dominates is a kind of democratised-picturesque in which the visitor gets too close to the geometrical shapings and too enctangled in the ruins of scared/restricted chancels and backstages – is this what generates an encounter that some of saw on the edge of the deer park; a stag alternating between grazing and staring at the visitors gathering a few feet away to photograph it. Too welcoming, too empathetic, too sentimental. Little sense of ruin, ruined, ruining.